Never again will you have to splurge on a pricey mall pretzel when you can make these Perfect & Easy Soft Pretzels in the comfort of your jammies at home! 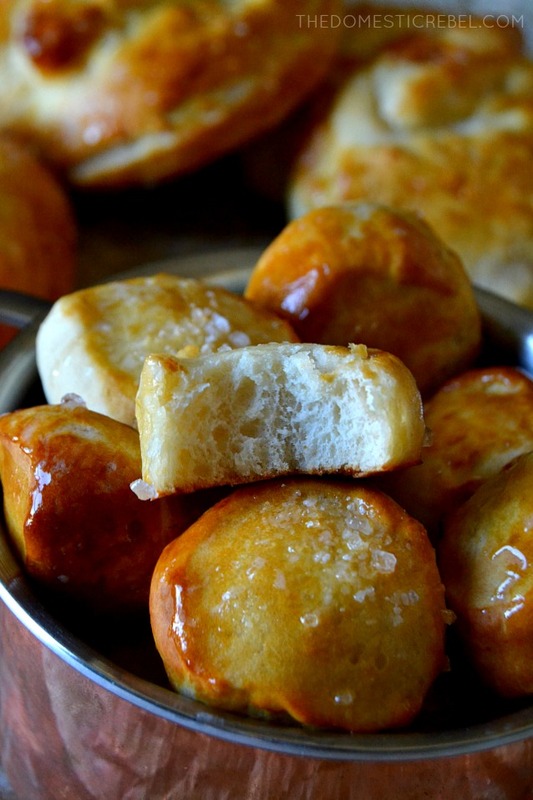 Super soft and chewy with a light brown crust, they’re buttery, fluffy, and simply perfect! You guys. I did a thing. I made homemade pretzels. And it changed my life. I know that sounds dramatic – how can a pretzel possibly be life-changing? Well, when your life consists of furry sandals, Criminal Minds reruns and eating Goobers on repeat, it IS life-changing. It’s the little things, people! Let me have my moment! I dunno why I put off making pretzels from scratch before… possibly because I’m still newish to yeast-based doughs and because there’s the whole step where you boil them. It just seemed… scary. Daunting. Intimidating. 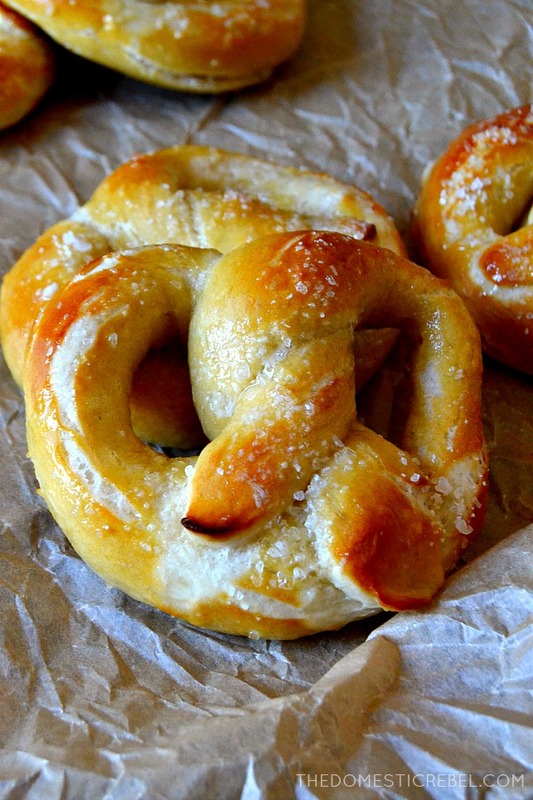 But I promise you – these Perfect & Easy Soft Pretzels are none of those things! I’m gonna hold your hand and walk you through the steps to making these beauties from scratch in the comfort of your own home. Because if your mall’s pretzel shop is anything like mine, there’s always a mile-long line that I don’t want to waste my time in. (Wasting my time in Sephora, however, is preferred). 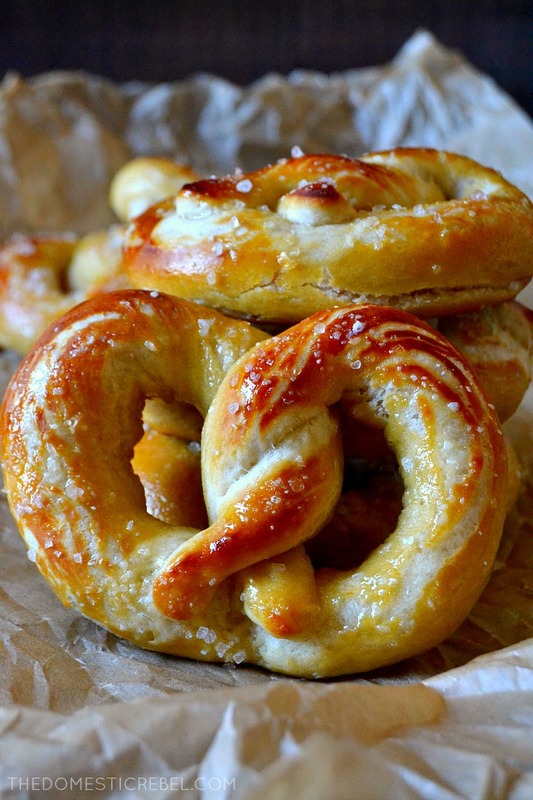 So for these pretzels, you’ll need some pantry staples. Literally nothing in this recipe requires a special store-run or anything fancy or special. 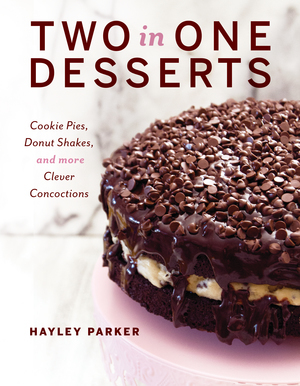 Flour, yeast, butter, sugar, baking soda, and salt are pretty much the only ingredients, but when you add them in the right steps, magic happens! To start, you’ll make your dough. You’ll mix together some yeast and warm water, then toss in butter, sugar, salt, and some of the flour. Let your stand mixer do the work for you and knead that sucker with the dough hook. Of course, you can make this by hand… but you’ll definitely be getting some muscles as a side-effect. Add in some more flour to make the dough pliable and bouncy. If you touch it with your finger, it shouldn’t stick but should spring back lightly. Because I love you, I made this dough my you-know-what and ensured you only have to let it rest for 20 MINUTES! That’s like nothing when it comes to yeast doughs – pretzels especially. They usually need an hour, sometimes overnight (what! 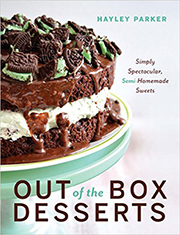 ), but this just needs 20 minutes to chill before they bake. Easy! While they’re resting, you’ll get your oven preheated and your water mixture ready. Baking soda basically gelatinizes the outside of the pretzel, preventing it from fully springing up when baking (like most bread does). 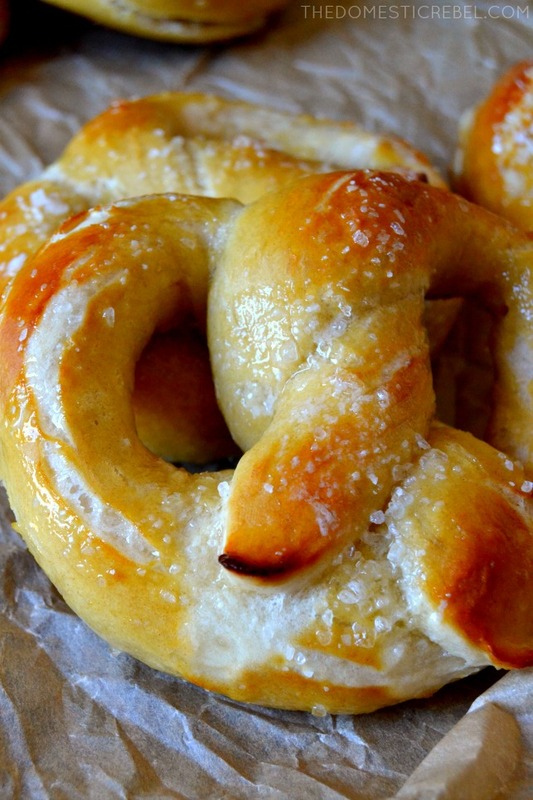 The baking soda bath gives pretzels their signature chewy crust and lends that authentic pretzel flavor. I promise, par-boiling these lil guys is not as daunting as I thought it’d be! I just shape the pretzel dough into that iconic pretzel shape, place it carefully onto a slotted spatula, and lower the spatula into the gently boiling water for a few seconds. Let it float and par-boil for 30 seconds tops, then gently remove them, let them drain, and place them onto your greased baking sheets. Sprinkle them with salt and bake! 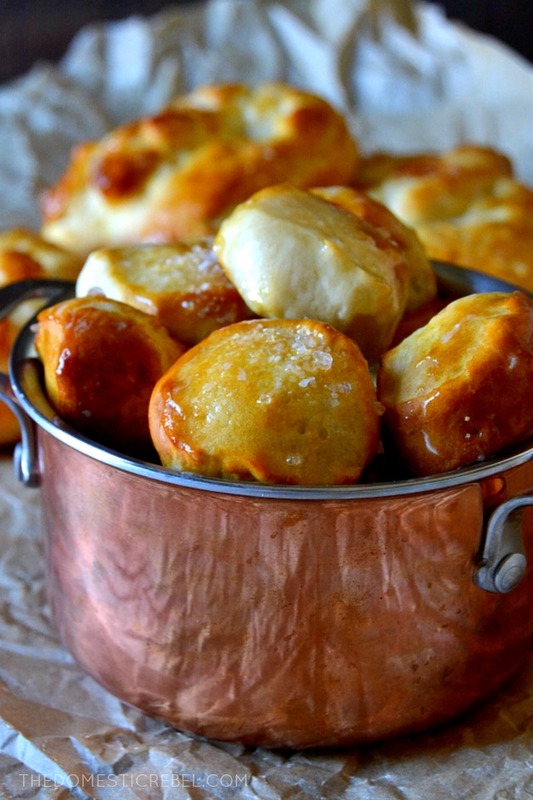 Soft and chewy pretzels with a fluffy interior and a golden brown crust! Don’t forget to slather them with hot melted butter after baking to really drive home that mall-pretzel flavor! Oh, and if rolling pretzels isn’t your forte, feel free to make pretzel nuggets! Just roll them into a a rope shape and cut into 1-2″ nuggets with a knife or pizza wheel. Par-boil, sprinkle with salt, and bake! How cute!! 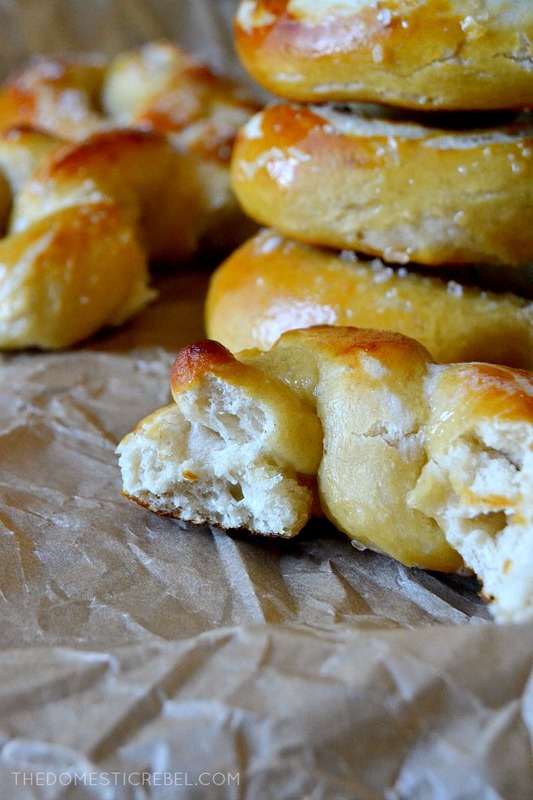 These Soft and Chewy Pretzels are so perfect and so simple! Even novice yeast bread bakers will find this recipe easy and fast! Only a 20 minute proof time before you have perfect mall-style pretzels in the comfort of your own home! Place the warm water in the bowl of your stand mixer. Sprinkle the top of the water with the yeast packet. Let it dissolve for about 2 minutes. Once dissolved, add in the softened butter, brown sugar, salt, and 2 cups of the flour. Using a dough hook attachment, mix on medium-low speed until a sticky dough comes together and dough is smooth. Stir in any remaining flour, ¼ cup at a time, until dough begins to pull away from the sides of the bowl and when touched with a finger, does not stick and springs back lightly when touched. Place in a lightly greased bowl and cover with a tea towel. Let rise in a warm place for 20 minutes. Preheat oven to 450°F. Line 2 baking sheets with silicone liners or parchment paper. GREASE whatever liner you use - trust me on this! I just spread a stick of butter around the parchment paper to make sure it is greased well. Punch the dough down a couple times to break up any air pockets. Divide the dough into 8 equal pieces. The best way to do this is to cut in half with a pizza cutter, then cut each half into fourths. Using your palms and the heels of your hands, roll each piece into a 12-15" long rope on a clean work surface - do NOT flour your work surface, as this will prevent the stretch of your dough. Shape the rope into a circle with about 2-3" inch of each end overlapping (think the shape of a breast cancer awareness ribbon). Twist the ends where they overlap, then flip the twisted ends over the circle, pinching the ends into the circle to form a pretzel shape. In a large saucepan, bring the water to a boil over medium heat. Add in the baking soda; mixture will bubble violently for a minute. Drop a pretzel into the boiling water using a slotted spatula. Let boil for about 30 seconds, then gently remove with the spatula, allowing excess water to drip off. 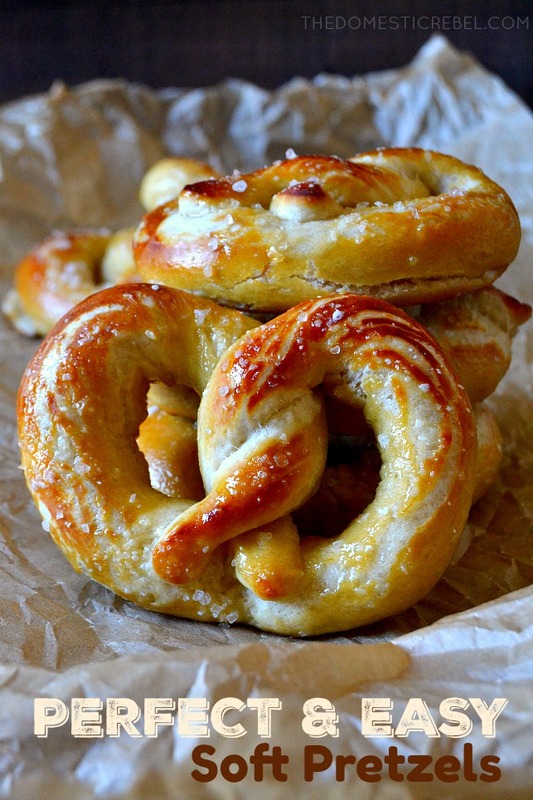 Place on the greased baking sheets and shape back to pretzel shape if needed. Sprinkle with coarse sea salt, if using. Repeat with remaining pretzels. Bake the pretzels for 10-12 minutes, rotating pans halfway through baking time to ensure even baking, or until golden brown on top. Brush with melted butter while still hot. Serve warm or room temperature! I just made these. AMAZING! No, really, I”m not just saying that. AMAZING! Exactly like a mall pretzel. The twisting was the only part that was a little tricky. Andrea, I am so glad you loved them! The twist definitely takes a little practice but no matter how they’re twisted, they taste great! 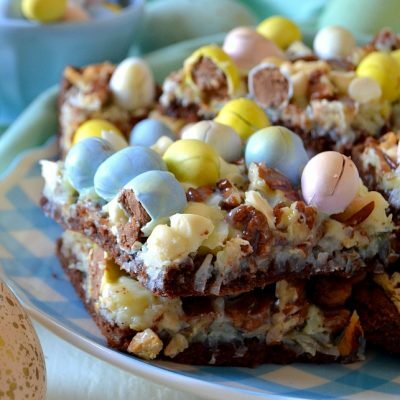 Have you made them with cinnamon and sugar? Wondering if I would put it on before baking like the salt? Hi Andrea, I would omit the salt, bake them plain, and then once baked, brush with butter and sprinkle with cinnamon sugar! I don’t have stand mixer, can I make it with just a regular mixer? Yes, but it’s going to take longer – and you’ll get an arm workout! Yay, so glad you loved them, Cathie! I was wondering if you ever made this with the mini hot dogs? I know my mall does this and I don’t want to spend almost 12 dollars for a cup of them, plus I want to make these for my family for Christmas. Hi Savannah! Yes, that would be awesome! So instead of creating the traditional pretzel shape, I would still roll it out into a long rope, then cut into maybe 1-2 inch pieces with a pizza cutter or knife. Wrap the pretzel rope piece around the Lil Smokie hot dog and then dip in the baking soda solution and bake. Hope this helps! These are delicious!!! Thanks for sharing!!! Hi Jeff, you could try letting the dough set for a few hours. It shouldn’t be too bad. These are wonderful! Can they be frozen? At what point in the process? Hi Cheryl, I would freeze them after baking! Just thaw at room temperature or in the fridge and reheat in the microwave.